Description: Annual herb, ± woolly; stems usually erect or ascending, branched basally and at upper nodes, 4–13 cm high. Leaves narrow-oblanceolate to ± linear, c. 20 mm long and 2 mm wide, uppermost leaves with small hyaline appendage at apex, ± woolly. 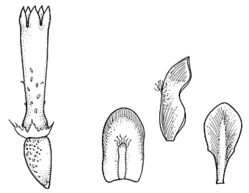 Compound heads elongate, c. 15 mm long; general involucral bracts c. 6, usually inconspicuous and < 4 mm long; partial heads 100–300 each with 2 florets; subtending bracts usually 1–3, c. 2.5 mm long, midrib ± herbaceous and ± hairy near apex; concave bracts similar; flat bracts 2, obovate and abruptly attenuated in towards base often with dissected wing-like extension from outer surface. Florets yellow. Achenes ± obovoid, c. 0.7 mm long, papillose; pappus cup-shaped, ± jagged, often with 1 or 2 bristles. Distribution and occurrence: Grows in open areas on sandy soils, west from Booligal.